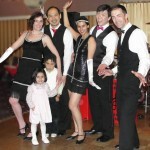 Fidgety Feet formed in 1998 as an entity for sharing and preserving vintage swing dance styles and techniques. Since then, the troupe has delighted audiences at venues such as Washington, D.C.'s Kennedy Center, the Corcoran Gallery of Art, the Ronald Reagan Convention Cener, the DC Convention Center, the Smithsonian's Museum of American History, and the National Air and Space Museum. Their clients have included Fortune 500 companies like Caterpillar and GlaxoSmithKline, high technology corporations like MicroStrategy and UUNet, associations and non-profits like the Glen Echo Park, the American Heart Association and the Christian Communities Group, and retirement communities and community groups such as the Chevy Chase House and the Arlington Symphony. The troupe has also performed at private parties such as birthday celebrations and class reunions. Fidgety Feet also competes in national swing dance competitions and holds, among other titles, the team championship title from the 1999 Virginia State Open Swing Dance Championships. They specialize in swing dance styles from the 20's, 30's, 40's and 50's. Whether you're seeking flappers from 20's style Charleston, WWII-era jitterbugs, or the wild aerials from 50's style rock-and-roll dancing, Fidgety Feet can accommodate your needs. They can provide the whole troupe or a single couple for demonstrations, mood settings, or lessons.